Liebert Mini-Mate, Ceiling-Mounted Variable Capacity Cooling, 17.5kW, with 5-ton variable capacity, is an efficient and reliable ceiling-mounted precision cooling system for edge computing and other small IT spaces. It saves customers money and increases IT protection through a high-efficiency variable capacity design, fast installation, lower maintenance requirements and built-in remote monitoring and management. Available as an air-cooled split system, the Liebert Mini-Mate is an economical and reliable solution for mission critical applications. It is designed to operate reliably 7 by 24 for over 10 years. In addition, it provides the maximum efficiency and scalability needed in small IT spaces through direct-drive variable speed fans and variable capacity compressors. The Liebert Mini-Mate comes with advanced Liebert iCOM™ controls for multi-unit teamwork and automated protection routines. In addition, remote monitoring, management and alarm troubleshooting are available through an integrated iCOM CMS Monitoring and Control System, which operates as a mobile app, on secure desktops and via building management systems. Of special importance to contractors and facilities managers, the Liebert Mini-Mate3 simplifies installation and maintenance. It can be accessed for maintenance from the front, and its single-side access reduces ceiling space requirements, compared to systems which require two-sided access. 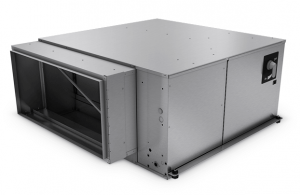 It also can be installed in side, back and down airflow configurations, making it highly adaptable to locations with space limitations. It also uses no belts and has fewer moving parts than alternative systems, significantly reducing the need for repair and replacement.